I’ve been thinking about talking about this subject for some time, as I feel that there’s virtually no information on this issue in English. 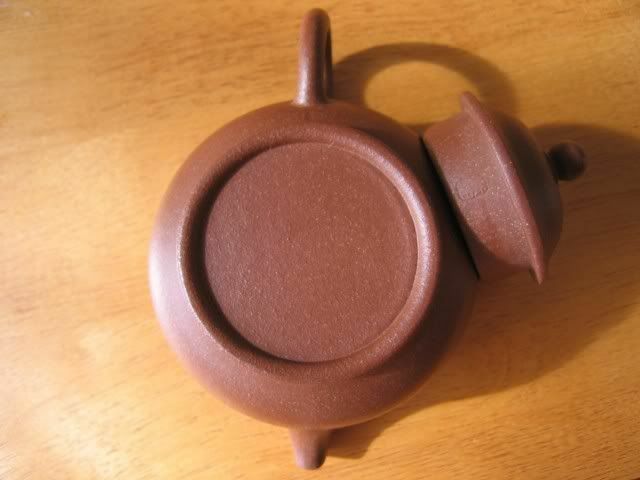 The only one I’m aware of that is of substance is Billy Mood’s Yixing Teapot article, especially the section on “The Seal Chops of Zisha Teapots”. I’d also suggest reading the next three sections, as they also contain useful information about this topic of seals and inscriptions on pots. One of the first thing that should be noted is that I am by no means an expert on this subject, but merely sharing what I’ve learned from various channels, both on and offline. There are also some basic things that I think can be better illustrated with some pictures, so I decided to use what I’ve got with me to do that. They are most typically four words constructions, although sometimes you might have six or even other arrangements. If it’s four words, the most likely thing it says is merely the name of the maker, which usually consist of three characters, and then the word “produced”. The reading order for the characters is top right, bottom right, top left, bottom left. There are exceptions to this, but the order above is easily the most common. 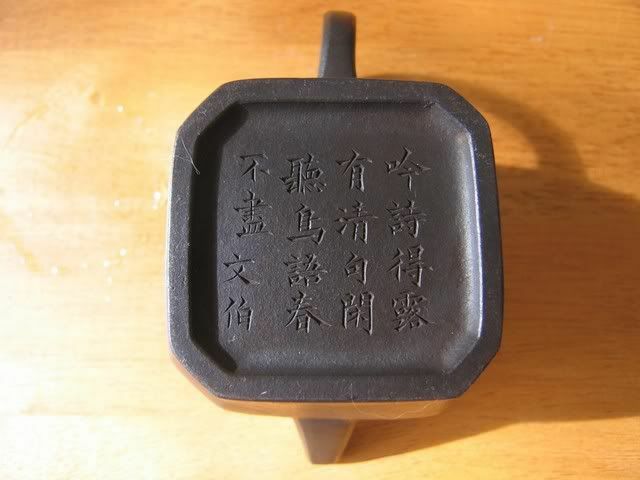 They are usually in some sort of “seal script”, which is a writing style that is now only used for seal making and not much else (although you see it in other places, such as the wrappers of Yichang Hao puerh cakes in certain years). They are not easy to decipher, but with some practice they shouldn’t be too difficult either. are not trying to masquerade as Qing pots. This is more or less just a generic seal that is used for many, many kinds of pots. Some people can go and date these seals, as different period ones or seals used by different people (but saying the same thing) have different characteristics. Some might be more valuable than others. This is sort of like tracing down different kinds of wrappers, looking for the tiny font differences, wording differences, the extra dot on the word, etc…. all pretty esoteric stuff that requires the patience of a librarian and lots of experience. I don’t have that sort of experience, nor patience. The small seal on the right is the family name of the potter, while the other is his (or her) given name. Sometimes a small imprint like this might go under the handle and not the lid, but so far, among all the pots I’ve seen on and offline, small imprints like this are most often the name of the potter. For a bunch of Republican period (1911-1949) pot workshops, their shop name is put at the bottom of the handle. Chances of most of my blog readers seeing a genuine article of these, though, is unfortunately fairly low. This is a reproduction Panhu (literally Pan pot). It is thus named because the person who made them famous was a Guangdong province salt merchant named Pan Shicheng. He would order them made, and used them as gifts, for family, etc. 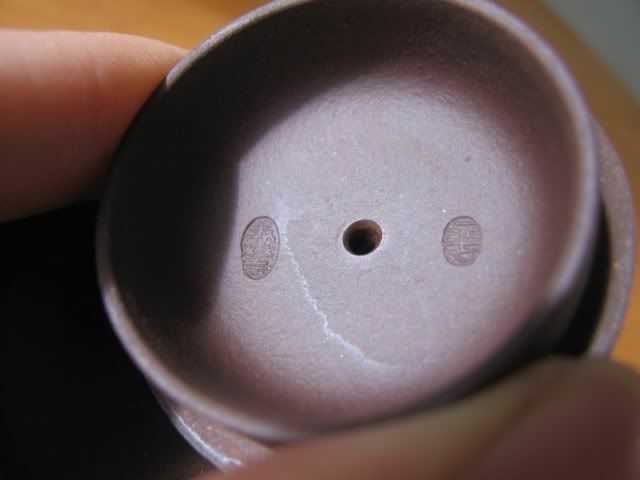 Panhu generally have no seals in the bottom, and only one on the “lips” of the lid (you can see it in the picture). This particular one is a reproduction because it’s not expensive enough to be a real one, and also because the shape is not quite exactly right. I am wondering if I should get rid of it, because while I like it, I don’t really have a use for it. The point though, of course, is that some pots are going to have no seals of any kind, and that some have one on the lips of the lid. Just something to look out for. You can probably see the huge difference in the two. While the first pot’s writing is wiry thin, the second is not, with clear points of incision that lets you follow the strokes. This is actually two lines of verse — 7+7+2, with the two saying “Wenbo” a person’s name (in this case the name of the person who wrote these words on the pot, not the potter). The use of such a tool to carve words does not denote old age — it is entirely conceivable for somebody to do it now. The first pot’s wiry words are probably carved using a metal pen of some sort — just a wire, basically. There’s that evenness in the words, but at the same time, the calligraphy is also vastly inferior. Again, great calligraphy is not a sure sign of an old or great pot, but I’ve never seen a pot with poor calligraphy (sometimes with words that look like a kid’s handwriting — and not deliberately so) that’s great. Which is just two words, supposedly denoting the maker. This is quite unusual, and chances are, it’s not actually from a hundred years ago as this is never really done, according to some people who seem to know the subject much better than I. It’s much more likely a more recent reproduction hoping to put a famous potter’s name on the bottom in the hopes of somebody buying it. This pot serves me well, as some of you may recognize it as my hotel survival pot. I just don’t have any illusions as to its old age. Thanks for the article, it was a good read! I don’t think I have any real recommendations to be quite honest. I buy my new pots in person. 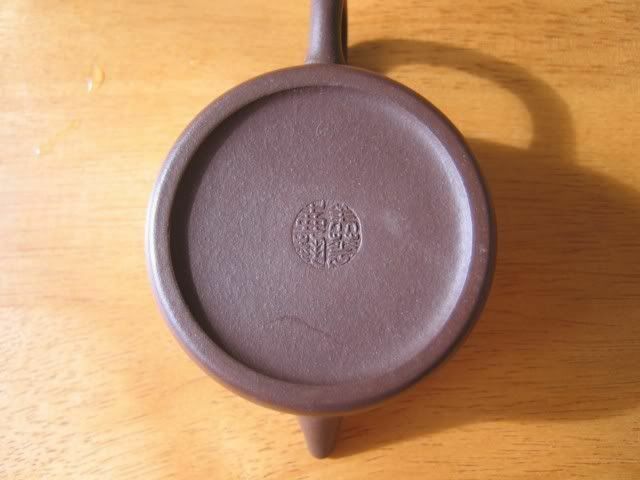 Today I was looking at a lid from one of Scott’s lao zhu ni’s. it was the diameter, but that does not appear to be the case either. Pots are a minefield – every pot collector i speak to admits to having to pay his ‘tuition fees’ and will have several pots in his stash which he/she paid too much for and were not what they were supposed to be. Clay quality certainly can be visually discerned up to a certain level (in my opinion) beyond which it is not as easy to really say whether it is of a certain pedigree … and (i believe) many in the industry come to rely on reliable sellers to verify the history of the pot – once that person cannot get a reliable confirmation where the pot originated from the authenticity becomes certainly dubious. Craftsmanship is much clearer as it is much more difficult to fake the touch of a true master if one has a practised eye (or so i am told). When you get to pots worth USD$6,000.00 (which i personally held in my hand and had no inkling of its value!) and even to ones worth $40,000.00 or more the mark on the bottom is just one of the things that must be correct but not necessarily the decider of authencity. original branded one Yixing factory 1950-1960 period. 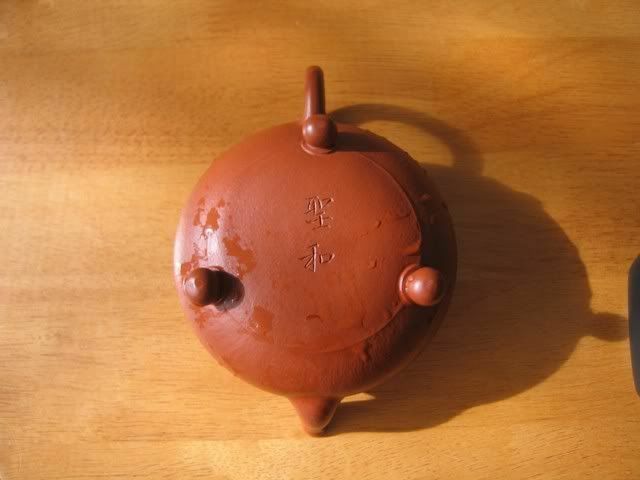 Does any wise collector know what time period a tea pot made from “Shì yǐn” ? And, is this a master tea pot maker? 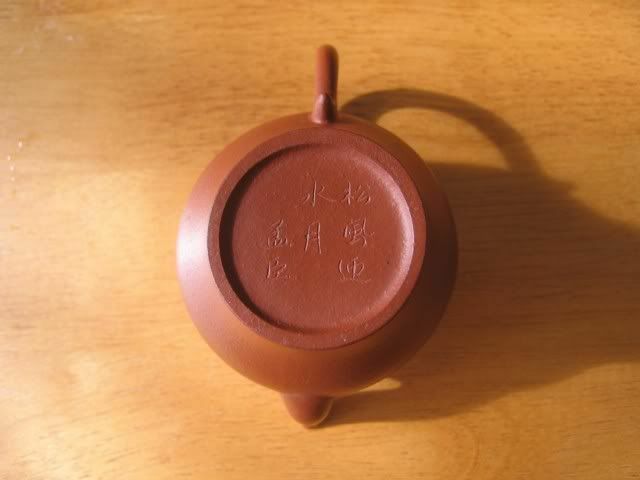 Just bought teapot with “Jingxi Hui Mengchen Zhi” on the bottom (exactly like the pic you provided in article). Tea dealer swears it’s zhuni and about 40 yrs old. Think I might’ve paid too much for it. Did I just get swindled? 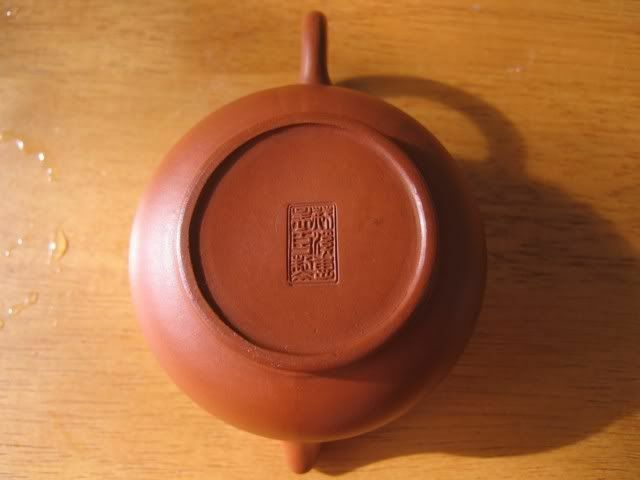 Purchased a teapot with “Jingxi Hui Mengchen Zhi” on the bottoms. Tea shop owner claims it’s a zhuni and more than 40 yrs old. Hi can I send a picture somewhere to find out what kind of teapot I have. I purchased it 30 years ago at a yard sale in a nice area and have always loved it. I have often wanted to find out its value of any bit not sure where to bring it.